So What Is a Pocket Microscope? 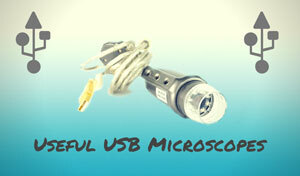 A pocket microscope is exactly what you think it is, a microscope designed to be small and portable. Although many are truly pocket-sized, others are slightly larger. Their small size and varying levels of magnification make them an extremely versatile tool for professionals and amateur scientists alike. 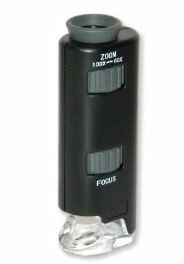 Most pocket models have a light on one end and an eyepiece on the other. Some have a tiny staging area, which is a base where you can put small objects and hold them in place while you view them. 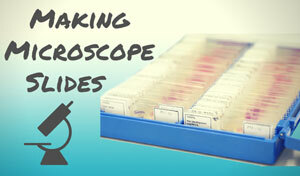 If there's no stage the microscope is simply held over the object and moved around until you get the right angle. Although less common now, some pocket models display an image that is reversed. This is due to the microscope using mirrors and lenses to magnify the image, not unlike what happens in your eye. 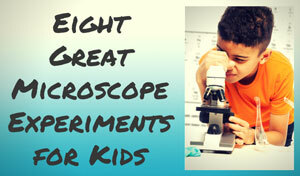 However, a small microscope may not have enough space to hold the mirrors that correctly reposition the image. Thus you'll always see the picture in reverse. This takes some getting used to, and may be too confusing for some. It's just something to watch out for when buying a very small microscope. These products are popular with parents of small children. They are very easy to use and usually relatively inexpensive, making them a fun and educational introduction to the microscopic world. They're a great gift for the budding scientist. So what's the best pocket microscope? That depends on your needs. Models vary greatly in terms of size, cost, quality, and features. Magnification usually ranges anywhere from 30x to 100x, with some models having variable settings. Most have some sort of light source, and some even have camera attachments that let you take pictures. While it may not seem like much to the high power microscope user, a magnification of 30x can show you great detail. 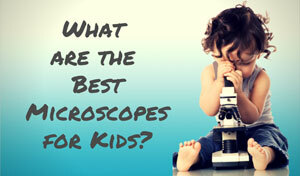 This microscope was built for younger kids (6-12), but it's far better than a simple toy. Hours of educational entertainment are granted by the ability to see the world 30 times larger. Given the cheap price and ease of use, we think it's a good investment for jewelers or casual hobbyists as well. The one downside is that you'll have to provide your own batteries. If you're tired of constantly changing batteries and want more illumination, consider purchasing an LED model. With LED illumination, the lighting is more powerful and efficient. This is a mini microscope, so it's pretty small even for a pocket model. The diminutive size could be an advantage for those wanting to do horticultural or biological work outside. For under $10, it's cheaper than many jewelers' loupes and provides brighter light and a clearer image. An extremely versatile product for the price. Looking for something with more powerful magnification than a simple 20x, 30x, or 45x? Some have a power range between 60x and 100x. The higher magnification makes them more suitable for fieldwork, while still remaining easy to use for hobbyists and kids. Although some users lament the fact that there's no stage, this is still a good value for the price. It usually retails for under $15, which seems a fair deal for an instrument that provides a good image with up to 100x magnification. 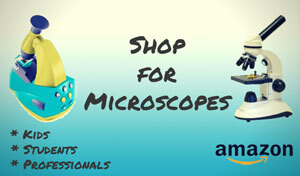 As you can imagine, there's a wide variety of pocket microscopes out there for a multitude of different uses. 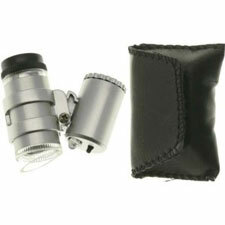 These products offer convenient portability and relatively powerful magnification at a cheap price. So whether you want a 30x kids microscope for outdoor fun, or a 100x LED model for inspecting small parts, there's bound to be a product out there for you. Just remember not to sit on it after you put it in your back pocket!